Local residents around Sydney’s Harbour Bridge will no longer be disturbed from the noise of a powerful machine used to clean the iconic landmark, thanks to an innovative solution from Australia’s largest supplier of shipping containers. 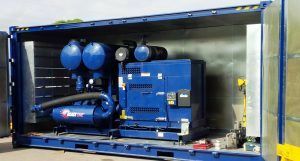 Royal Wolf transformed a 20 foot unit for Blast-One, a specialist supplier of protective coating and corrosion control products, to house the diesel powered vacuum when cleaning abrasive material from the bridge to ensure it shines. Adrian Massey, State Manager at Royal Wolf South Australia, said the container offers the ideal noise pollution barrier to protect Sydneysiders who live near the bridge. “We worked with Blast-One to create a customised product with a side opening wall, paint job to withstand the harsh harbour environment, sound-proof interior to reduce noise of the machine to fewer than 85 decibels and built attenuators into the side walls to reduce the power signal,” he said. Jesse Bennett, Project Manager at Blast-One, said the company was impressed with Royal Wolf’s ability to tailor the container to its needs. “The unit can be easily transported to different locations around the bridge and will also prolong the life of our sophisticated equipment kept inside,” he said. 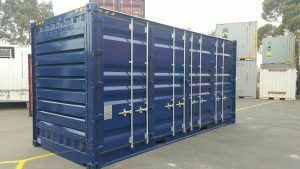 Royal Wolf containers offer practical and cost effective sound barrier solutions and are suitable for a wide range of activities including construction sites, music events and festivals. With 22 dedicated Customer Service Centres across Australia, Royal Wolf's solutions transcend state lines, with the ability to provide tailored containers quickly and easily from state to state. Royal Wolf Cavan Customer Service Centre is located at 160 Churchill Rd North Cavan, South Australia, call 08 7087 2301.